I rarely look up at the big screen during the 25 minutes of advertising before the movie starts. Call it my form of non-violent protest. Once the movie starts, though, I rarely look away. But reader, I confess: I looked away during a scene in director Damien Chazelle’s new film First Man. It happened during a grueling sequence: Astronauts Neil Armstrong (Ryan Gosling) and Dave Scott (Christopher Abbott) lose control of their space capsule high above the earth and spin out of control. For a long, long time. Imagine being locked into the world’s maddest tumble-dry-cycle. Dizzy from the kaleidoscopic strobing, buffeted by the roiling noise, I had to manually override my suspension of disbelief and come “back down” to the tactile details of my vinyl recliner for relief. Though I didn’t realize this until later, the scene was calling back the sense of helplessness and panic I’d experienced not so long ago when someone I love suffered a grand mal seizure. No wonder I couldn’t bear it. Car accidents, violence, job loss: We can be deeply scarred when our circumstances are overturned by forces beyond our control. Time doesn’t heal those wounds; we may bury them, but they stay open. Armstrong, according to this film’s subtle logic, might have found the willpower to recover control of that capsule precisely because of a traumatic experience he had suffered years earlier, losing his daughter to a terminal illness. Was that what drove him to make it through that vertiginous zero-gravity trouble, and then later complete a circuit to the moon and back? Was it a refusal to accept defeat? A drive to meet the laws of nature head-on and show them who was boss? Maybe. 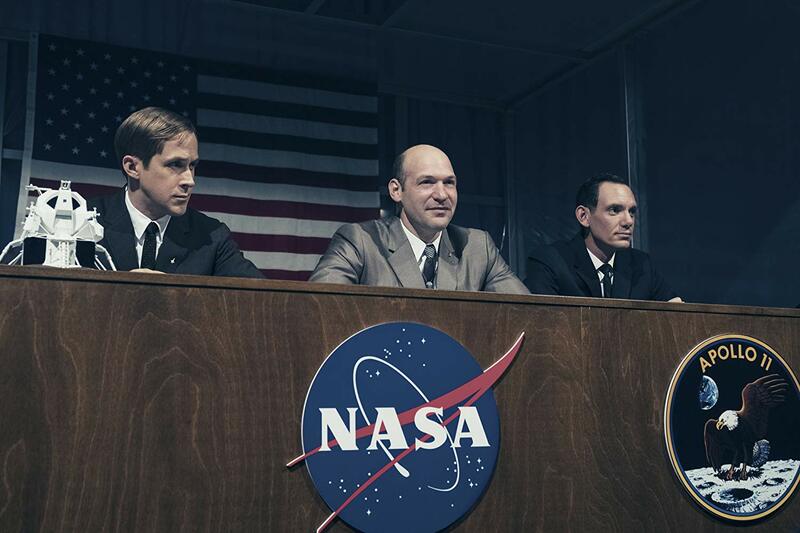 First Man is not the kind of movie that offers easy insights or neatly packaged answers for anything. Nor is it the first movie to vividly capture the fragility of space travel. We’ve seen The Right Stuff, Apollo 13, Gravity — we know the drill. We know that unnerving sensation of being catapulted beyond the reach of any gravity or help, and that ironic claustrophobia of floating through the vastness of space strapped into a tin can that rattles like a 40-year-old Volkswagen Bug. We shouldn’t worry, though: We have history’s assurance that Armstrong and Scott don’t end up lost in space. So we know where this is going: a successful moon landing, a triumphant return of our heroes. At least, we think so. But Chazelle doesn’t seem particularly interested in that familiar story arc. While he manages to make those scenes of gyroscopic chaos more rattling than any big-screen amusement park ride I can remember, he’s aiming for something more substantial than a “ride.” This feels weightier. It feels like there’s much more at stake than national pride, macho accomplishment, beating the Russians, or any of your typical space-movie motivations. Sticking respectfully enough to historical details, Chazelle attends to much more than the vainglorious aim of being “the first.” As he was when he directed Whiplash and La La Land, he’s interested in what compels human beings to reach for the stars — and perhaps even more interested in what it costs those who do. The Whiplash drummer Andrew makes a Faustian bargain, alienating his loved ones in his quest to overcome obstacles and achieve one taskmaster’s definition of excellence. In La La Land, Mia makes a “Mia-first” commitment, losing love in pursuit of success. 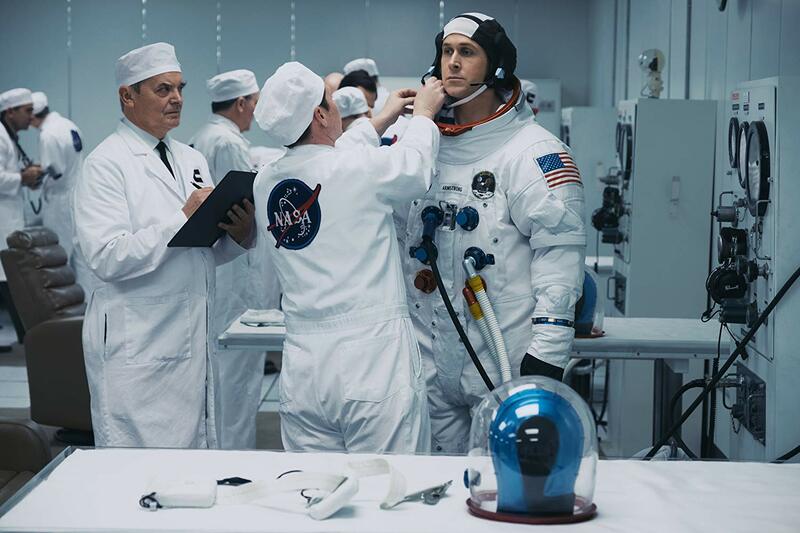 In First Man, the stakes are just that high, but the motivations are more mysterious. Gosling’s Easter Island mug is ideal here: Armstrong’s inexpressive face remains as enigmatic and inscrutable as the moon’s. Just as he did playing the stoic control-freak in Drive, Gosling defies us to discern Armstrong’s reasons for sticking to NASA’s mission through one calamity after another. Drive worshipped the man who keeps his cool at the wheel through terror and carnage; by contrast, First Man inspires skepticism about the priorities of an American icon. And that makes for some tangible tension. This might seem like a vision of courage, of humble service, of hope. It might seem like he’s just “doing what it takes” to “be all that he can be.” And some of the bold, brave, ambitious candidates around him who dream of being the “first man” seem to fit the mold. 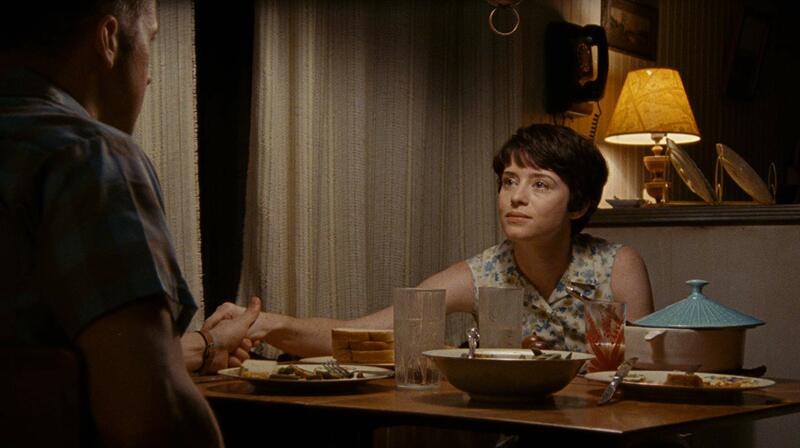 But — as this film powerfully reminds us — Armstrong isn’t free to act as a solitary agent. He’s married with children. And every time he takes these risks, he endangers his family’s heads, hearts, and futures. Making very much of a severely underwritten role, Claire Foy makes Janet Armstrong far more accessible and empathetic than Armstrong. For her, the family home can feel like a capsule spinning out of control, throwing her and her children against the walls while one would-be astronaut after another is lost to accidents. Alone with Neil, she rages against the “protocols and procedures” that “make it seem like you have it under control. But you’re a bunch of boys making models out of balsa wood! You don’t have anything under control!” Characterized by subtlety, toughness, and no-filter emotions, Mrs. Armstrong clearly loves her husband, is proud of him, has high expectations of him, and yet is also disappointed in him, afraid of what he is becoming, and yearning to keep him safely tethered to home. She seems almost maternal in the end, a guardian angel to a lost boy rather than a kindred spirit. Most movies of this kind aim to inspire us to become astronauts. And the most likely treatment of this story would cast Armstrong as taking that small but historic step because he dreamed bigger than anyone else or fought hardest or earned it in some way. But that narrative breaks apart in turbulence here. Instead, Armstrong is the “first man” because other candidates died in horrific experiments gone wrong. Yet, Neil Armstrong continues, driven by… what? Curiosity? A desire to glimpse some transcendent glory to quiet his troubled heart? He makes a good speech in front of NASA bigwigs to prove his qualifications for leading a mission. Perhaps our best clue is in his assertion that space travel “changes your perspective.” What kind of change is he looking for? One reading of Armstrong’s ambitions which might be tempting is that he loved his daughter so much that he wants to do this to honor her. But the accumulation of deaths over the course of the film argues against that — with each loss, he seems more madly determined (emphasis on madly). I’m tempted to read the film’s closing image — due to its provocative composition and complex reflections in glass — as a picture of permanent fracture, of alienation, of loss. Janet is unable to touch her husband through the quarantine glass. Like the husband returned from an anomalous and alien zone in Annihilation, here is Neil’s body, but he is someone else now. He may have drifted too far from himself and lost himself. For now, anyway, he is enclosed, insular, bound. She, by contrast, seems otherworldly, ethereal. Her face appears twice in that closing image, once looking up in to Neil’s solemn silence, and again reflected as an inverse duplicate, floating like a Chagall angel, on the other side of the frame, behind Neil. It suggests some kind of “giant leap” of her own. She surrounds him, gazing at him from both sides. It’s a picture of earnest empathy, that uniquely human superpower. She looks at him with all of the warmth and love and intimacy that he could never receive from the moon. As the end credits rolled, I kept thinking about Dave in the finale of 2001: A Space Odyssey. You probably remember that astronaut, and how, when the systems he thought he understood betrayed him, he was sealed outside of the world that could support him, the world in which he could play a meaningful role. Dave was left drifting off into cold isolation, his doom illuminated by distant and indifferent stars. Armstrong — this movie’s Armstrong, anyway — may have, in his anguish over loss and his determination to transcend the limitations of human experience, lost his access to the human experience he once knew. Something has sailed off into the void, unlikely to return, even as a starchild. His wounds are still wide open. The question remains: Can love reel him back in? It’s become the focus of Chazelle’s oeuvre — a cautionary correction to that perennial American mantra: “Shoot for the stars!” It’s a variation on that beloved poetry in First Corinthians 13: If you have the gift of jazz, if you’ve earned the spotlight of stars, or if you’ve tracked moon dust in on your boots, but you do not have love, you are nothing. So, go on — dream. But dream carefully.